Of the total number of 7,377 tweets, almost 33% were original tweets (2/3 of which included links and/or images), over 62% were retweets, 4.8% replies, accounting for a reach (= number of unique users that could have seen Tweets with the #ICCAWorld hashtag) of almost 2,5 million and almost 15 million impacts (= the potential number of times somebody could have seen Tweets with the #ICCAWorld hashtag). On 28 November, we had 1,666 unique contributors using #ICCAWorld. *: The total number of contributors adds up to 2,136, but obviously this contains a double count of contributors who contributed in at least 2 of the 3 timeframes included in this table. There were 887 delegates at the Congress. On 6 November, one day after the Congress, we had 963 unique #ICCAWorld contributors. In the 1.5 weeks after the Congress this number quickly climbed towards 1,500. 1,329 of the 1,611 Tweets in the week and a half after the Congress were retweets. As stated, it is not about the quantity. 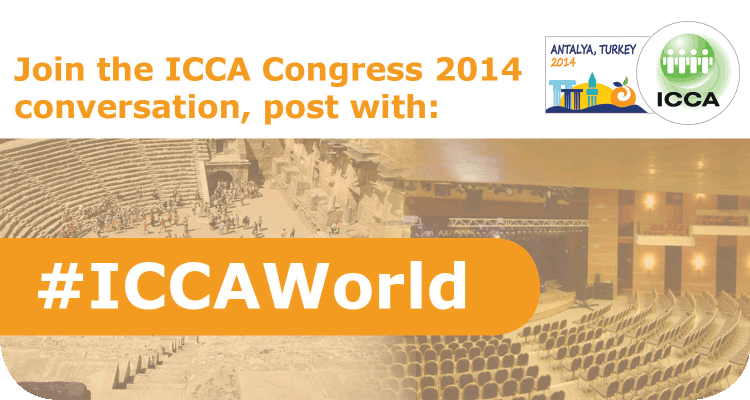 We encouraged everyone to use social media as a way to add value to the ICCA Congress. According to our post-Congress survey 59% of the delegates were active on Twitter before, during or after the Congress. 70% of those delegates using Twitter said it helped them to increase the value of their ICCA Congress experience, and almost 75% said they feel using Twitter helped them to increase their interaction with other members. Why take notes on a piece of paper if you can share them and allow the world to see? Conferences & tradeshows can be sources of wonderful ideas. By sharing their key takeaways on Twitter, participants are sharing their personal notes. Have a look at the Storify with key takeaways from #ICCAWorld Congress participants: https://storify.com/iccaworld/take-aways-from-the-53rd-iccaworld-congres-in-anta. They read as shared notes from the ICCA Congress education sessions. How useful is that?! “@ICCAWorld #ICCAWorld #ff #lumicatch #socialmedia stats proves that the #world is talking bout ur event & if u nt #online u missing out. So how come these stats are so high? The hashtag was prominently communicated through all our channels: Congress website, emailings, hard-copy programmes, Powerpoint templates, at tradeshows, Speaker briefings, via Spotme (which was our event app) messages and of course on social media. The hashtag and the way to use it was also communicated personally to important stakeholders like the ICCA Board of Directors and Chapter Chairs. In the first couple of weeks we had to address some people on Twitter to use hashtag #ICCAWorld for the Congress, but after 1-2 weeks of consistently promoting it, almost all members were using the proper hashtag. 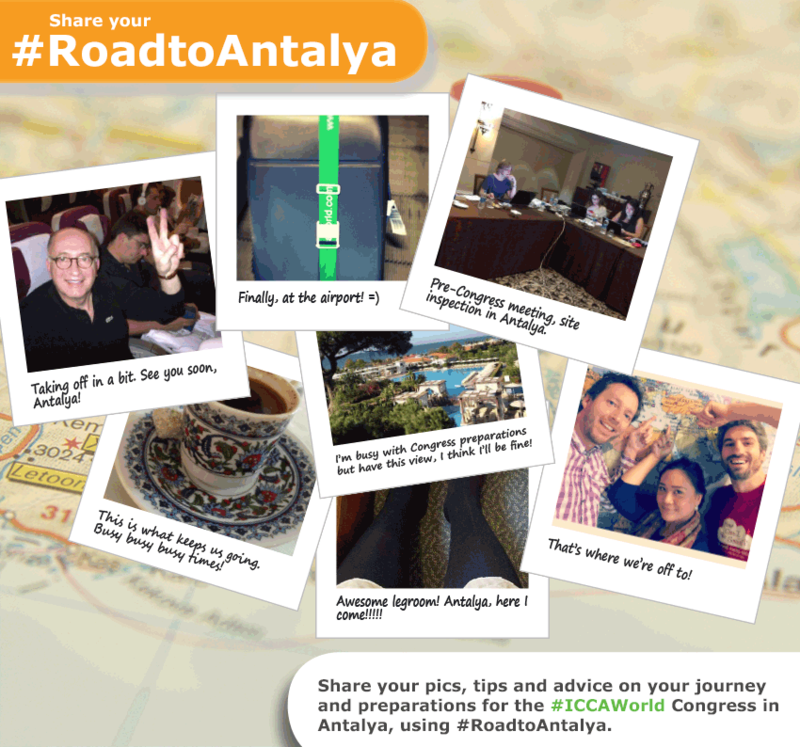 #RoadtoAntalya: “Share images, tips and advice on your journey to- and preparations for the #ICCAWorld Congress in Antalya.” (See #RoadtoAntalya Tweets in Storify: https://storify.com/iccaworld/the-world-comes-together-on-the-roadtoantalya). #SelfICCA: “Share the ICCA family love and take a creative selfie of yourself and other members at the ICCA Congress in Antalya. The more the merrier!” (See #SelfICCA Tweets in Storify: https://storify.com/iccaworld/faces-of-the-iccaworld-family). We reinforced these tips in all our communication and in the “#ICCAWorld Social Lounge”, where we had power plugs and Twitter screens. See #ICCAWorld Tweets on Storify: https://storify.com/iccaworld/take-aways-from-the-53rd-iccaworld-congres-in-anta We were not sure if it was going to be successful, as we had the challenge of both communicating our “new event hashtag” plus two other new hashtags. There were some concerns that people might get confused, but using different hashtags which clearly communicate different calls to action proved to have great effect. To stimulate preparations and build momentum for the Congress we asked delegates and speakers to share images, tips and advice on their journey to- and preparations for the Congress. A very important part in the #RoadtoAntalya campaign was to stimulate members to start preparing for the Congress using the ROI handbook and workbook, which is designed to help each delegate identify and maximise the benefits they gain from attending meetings, congresses and tradeshows. This online PDF document provides a detailed explanation of how each delegate can maximise their personal ROI, setting out key concepts but also providing practical advice and check-lists (http://www.iccaworld.com/cdps/cditem.cfm?nid=5096). The ROI Handbook was downloaded 614 times and the ROI Workbook 338 times. This campaign proved to be a success, and members spontaneously started tweeting about the #RoadtoBuenosAires and the #RoadtoArgentina straight after the Closing Ceremony of our 2014 Congress, so instead of starting 3 weeks before our 2015 Congress, we have already started our #RoadtoArgentina campaign 51 weeks before we go to Buenos Aires! The traditional CAT Night at the ICCA Congress is a night of playful but competitive games between regional ICCA Chapter members in a relaxed and loose setting. Members get very fanatic cheering for their teams, dressing up in team outfits, creating their own yells and team names, etc. Each year, pictures from the CAT Night on social media proved to be the most popular on social media. 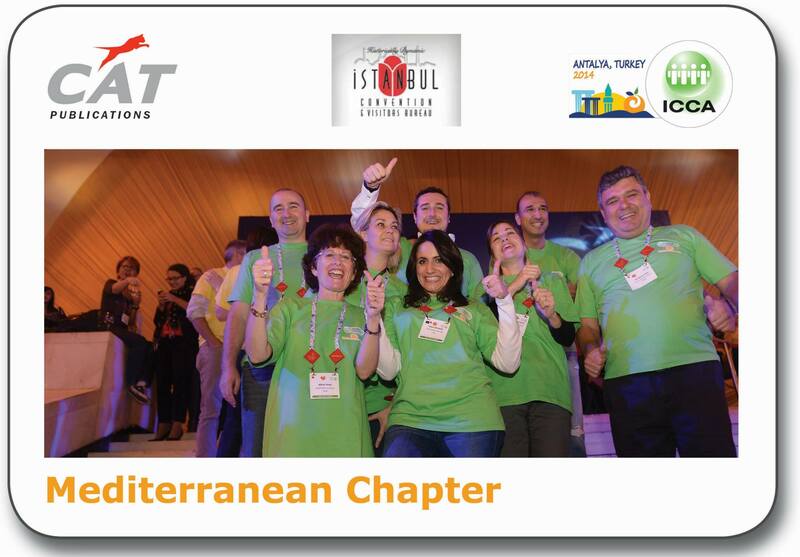 Knowing this, we tried something new this year with an “Istanbul CAT Night preview competition”: we shared pictures of all of the 11 Chapter teams from previous Congresses and did a competition to see which was one was the most “liked” ICCA Chapter. The winning picture of the Mediterranean Chapter had 89 likes. Even though the liking happened on Facebook, we drove the competition by also sharing the 11 pictures on Twitter and by email, linking to the pictures on Facebook and encouraging members to like their Chapter team. Without proper WiFi no Tweets from your event. While this issue is discussed a lot in our industry, proper WiFi still proves to be a challenge at a lot of tradeshows and meetings. Because live voting during the ICCA General Assembly was done with the Spotme Event App, it was crucial for us to have quick, reliable WiFi during the Congress, and we had. 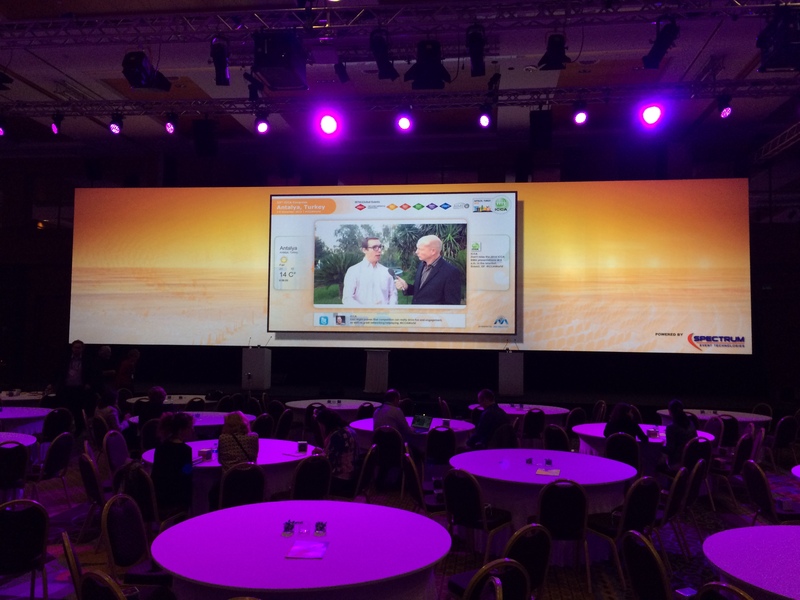 Event TV in the main meeting room showing video interviews and #ICCAWorld Tweets before the session starts. This may not seem like a big deal, but it is. 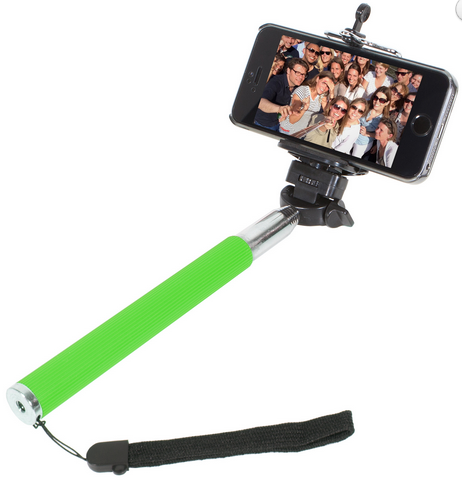 We have used them at a number of tradeshows as well, and experience taught us that just walking around with a selfie stick gets people’s attention, and they eventually come up to you and ask you to take a selfie with them! Moreover, you get to include more people! They are not expensive and I would recommend getting a version with a remote, so you don’t have to use a timer. Selfies still proved to be hot; we had 380 Tweets with #SelfICCA. When key players set an example, others will follow. Twitter is the best friend of meetings and events: All messages are open to the public, messages are quick and short, and you can easily group and find relevant messages with a hashtag. We focussed on Twitter as our main channel, but also had quite a lot of activity on other channels, specifically on Facebook and less in our member-only LinkedIn Group and on Instagram. Social media is all about personal connections. Nobody really likes communicating with a company logo. To personally involve more ICCA staff on Twitter, ICCA Member and Social Media Consultant Gerrit Heijkoop of HCIBS and I have done some Twitter meetings and trainings in the run-up to the congress. Apart from basic How to-trainings, we discussed how they can personally use social media in their ICCA activities, we tried to define personal goals, asked how the online community could help them and discussed what content is worth sharing with members. In a specific meeting about social media for the Congress we discussed how ICCA staff can help to facilitate and amplify the online discussion around the Congress on Twitter. As a result, more staff were personally involved on Twitter and reported from sessions they were personally involved in (i.e. ICCA Database Workshops) and answered questions with their personal accounts. ICCA is committed to educating young professionals in the meeting industry via the ICCA Education Fund. Each year ICCA invites Scholarship Students from ICCA member Universities to the ICCA Congress to learn about the international meetings industry. We asked these students to voluntarily join the “#ICCAWorld Social Media Support Team”. By doing so, they would have the perfect excuse to “break the ice” and network offline as well as online with many members at the ICCA Congress. We asked them to share key takeaways of Congress education sessions, their personal ICCA Congress story, selfies with members (using the selfie sticks) and pics which show the atmosphere of the ICCA Congress. Night- 8.00: Wrap up and look forward; Preparing daily schedule Good morning! ; How was last night? ; ICCA Congress Daily publication (schedule most important articles to be posted separately). 10.00-12.00: Moderate and report from sessions. 12.00-13.00: Lunch and afternoon session preparation Thanks lunch sponsors; Highlight afternoon sessions and speakers. 13.00-17.00: Moderate and report from sessions. We pre-scheduled as much messages as possible and divided content based on these themes. 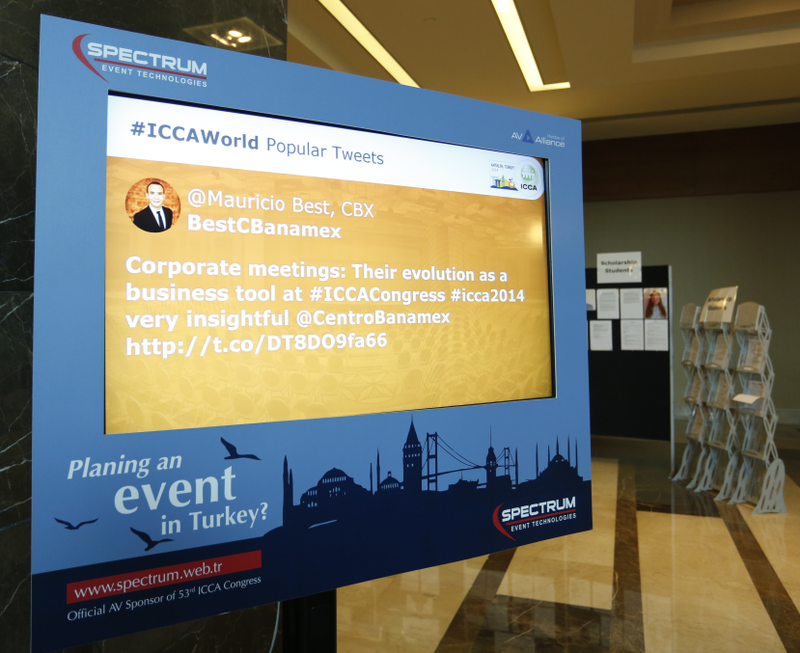 We included direct links to an #ICCAWorld Twitter feed, Send Tweet (automatically including #ICCAWorld) and links to the other social media channels in the menu of Spotme’s ICCA Congress event app, in order to make it easy for delegates to access and use our different channels. Content is king, also on social media. Our education sessions proved to have great content. I also noticed a trend that more and more speakers are including share-friendly quotes and infographics on their slides, that participants can easily take a picture of and share. A vital factor for social media of course is to make your content shareable. We did this by creating many banners and infographics: Our statistics show that Tweets with images create a much higher engagement than those without. 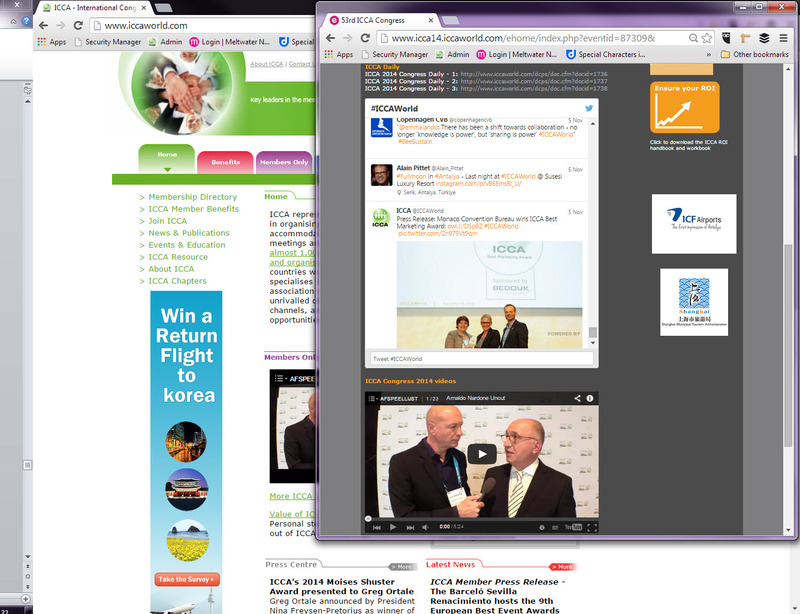 Videos: Ian Whiteling of ICCA Member Meeting The World did 2-3 video interviews per day (of max. 3 mins) with ICCA Board Members, speakers and delegates at the Congress, and he also create a wrap-up or review video of the whole Congress, which was shown at the Closing Ceremony. The content of these videos is great, but we find that video is a difficult medium to communicate online, and that they are not generating as much response as we hoped they would. Congress photos: The official Congress Photographers were uploading their ICCA Congress pictures in high resolution to the ICCA Flickr account 3 times per day during the Congress, immediately making them available to share. ICCA Congress Daily: We shared a PDF version of the “ICCA Congress Daily”, a daily newspaper published by CAT Publications, and shared the most important articles individually as well, linking to the PDF. News Reporting: In our live reporting on newsworty events, like the result of the presidential elections and the announced winners of the various awards, we always included pictures of the occasion, and published press releases the same day. The reaction of some of our industry’s social media experts shows that our Twitter activity was much higher than they usually saw. 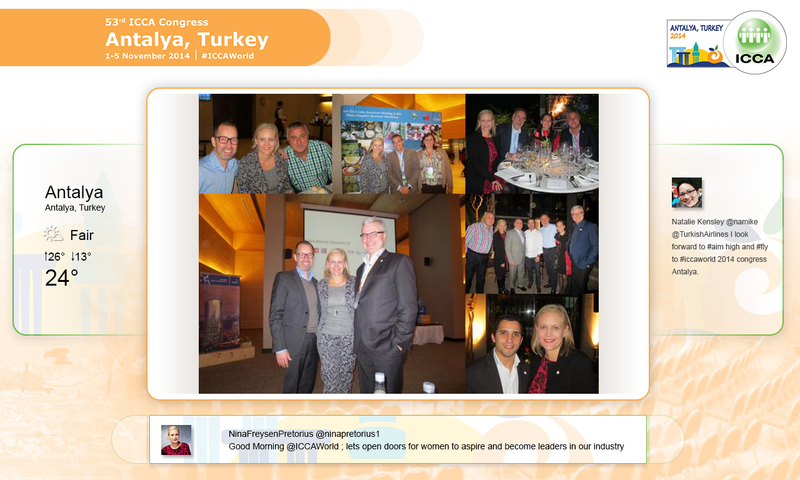 “It was great to see that the #RoadtoAntalya hashtag worked so well and I think it can be copied by other event planners and conferences. When trying to engage event delegates it is not only about communicating your hashtag, which ICCA has been doing very well for a while, it is about adding a purpose to a hashtag. What do we actually want people to share, so that when they get active on social media their network is seeing that they are going to the ICCA Congress and what they are missing out on, and that they should come next year. We know ICCA Congress delegates are are preparing for the Congress in the weeks before it takes place and are travelling to Antalya. They are preparing, they are packing, and they are waiting in airports: That is the moment you are getting into the mood for the event, and we were leveraging that with the hashtag #RoadtAntalya. It taps in with the FOMO trend: the Fear of Missing Out. Their network is seeing that they are going to the ICCA Congress and what they are missing out on, and are thinking: I should be at the next edition of the ICCA Congress!”. “After my own session “Content going Viral”, I found more than 50 @Mentions in my Twitter stream, commenting on the session, plus a lot more reactions without my own Twitter handle. 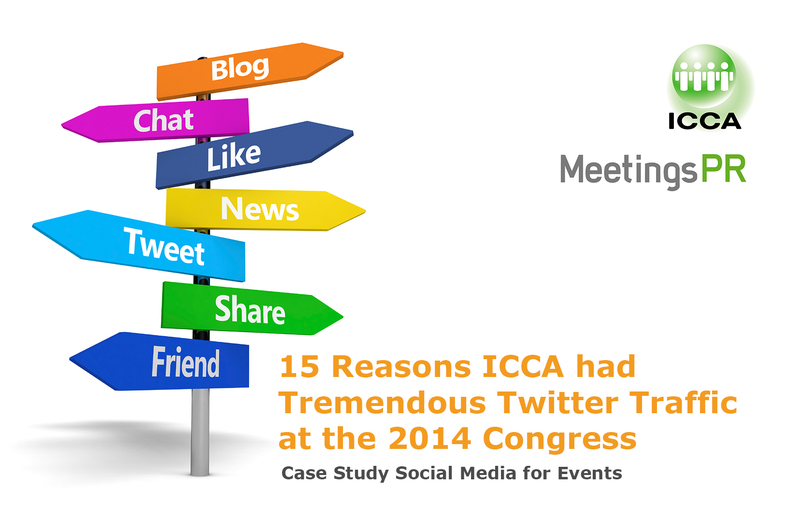 Wow!” See: “ICCA Congress propelled on social networks”. Or did we just get lucky? Did we do a good job to get this result or did we just get lucky? Is this just a reflection of the general trend that the meetings industry in general is increasingly using social media? We had a lots of very valid news stories to communicate from the Congress, which of course played a big role in getting the sharing rates up. What do you think? Does this case study give you any new ideas? Do you have any tips or ideas you would like to share with us? Looking forward to your comments!